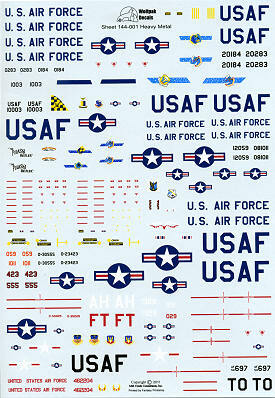 Wolfpak Decals has now moved into 1/144 scale with this first new sheet of theirs. Like all their other sheets, it has a multiple of subjects and like many of their sheets it is USAF. There are seven separate types on the sheet, several of them with multiple markings options. My apologies for the clipped subject image but Wolfpak insists on having longer than normal placement guides that won't fit on my scanner platen! So let's get under way. The first are a pair of B-47E options both from Pease AFB. One is from the 509th BW, and the other is from the 100th BW. Both are unpainted metal with gloss white undersides. You will notice that there are no under side or fuselage insignia on these planes. Next are a pair of AC-130A aircraft. The AH coded plane is from the 415 SOS at Hurlburt Field in 1972, while the red FT coded plane is from the 16 SOS at Korat RTAB. Another nice pair are these B-58As. There were only two bomb wings flying these planes and both are covered. One is the 'Pulaski Hustler' of the 43rd BW while the other is 'Greased Lightning' from the 305th. Both are from 1963/64 time frame. 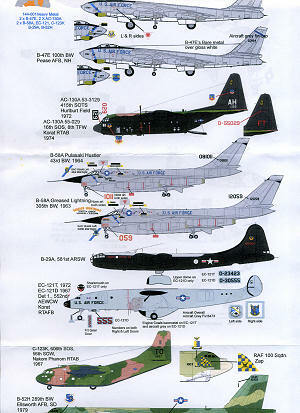 Moving to the black bottomed B-29, this one is from the 581st ARSW. These planes were designed to drop spies into communist countries of eastern Europe during the early 1950s and to provide resupply. A pair of EC-121s are next. One is an EC-121T from 1972 and the other is a very famous EC-121D based at Korat RTAB in 1967. 555 is one of the planes in the USAF Museum. Next is a C-123K from the 56 SOW based at Nakom Phanom RTAB in 1967. Finally, it the SIOP scheme is a B-52H from the 289 BW at Ellsworth AFB in 1979. It has a large 100 SQ RAF zap on the right side nose. Thanks to WolfPak Decals for the review sample. Visit their booth at the Omaha Nationals.